Chase just re-launched the mega bonus on their travel rewards credit card, the “Southwest Airlines® Rapid Rewards® Premier Credit Card,” which comes with a staggering 50,000 bonus points after you spend just $2,000 in the first 3 months of account opening. Those 50k bonus points are good for over $800 in Wanna Get Away® Fares, which can be redeemed for several free round-trip flights. If you fly short distances, such as from Los Angeles to the Bay Area, the points could mean more than five free round-trip flights! Not only that, but you get 6,000 bonus points every year on your cardmember anniversary, which is worth $100 in Wanna Get Away® Fares. The card has a limited-time balance transfer bonus of 1 point for every $1 in balance transfers, up to 15,000 points, though the credit card APR is above 0% so you’re probably better off with a pure balance transfer credit card if you need to shift some debt, such as Chase Slate. You can also earn 1,500 so-called “Tier Qualifying Points” for every $10,000 in purchases, up to 15,000 points annually, which go toward elite status qualification. In order to qualify for Southwest’s “A-List status,” you need to fly 25 Southwest Airlines one-way flights or earn 35,000 Tier Qualifying points each calendar year. For their “A-List Preferred” status you need to fly 50 Southwest Airlines one-way qualifying flights or earn 70,000 Tier Qualifying points per calendar year. So not only do get free flights, but you can also fly in style if you spend enough on this card! Once you hit A-List or A-List Preferred, your benefits kick in immediately and last for the remainder of the calendar year plus the full calendar year after the year in which you qualify. You can redeem your points by booking travel with Southwest via their own website. Simply select “show fare in points” to see what your trip will set you back. Round-trip flights from Los Angeles to San Francisco are less than 8,000 points in many cases if you plan ahead, meaning you could squeeze nearly six round-trip flights out of the opening bonus alone! Additionally, you can fly internationally using points if you book travel at Southwest.com, with access to 800 destinations on 50 different carriers. Once you log in to your Rapid Rewards® account, click on the “More Rewards” link to see your options. 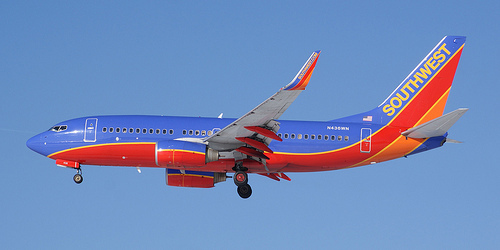 But points are not restricted to travel on Southwest airlines or its partner airlines. You can also use the points to redeem gift cards, go on cruises, or experience special one-of-a-kind experiences ranging from golf packages to spa treatments. One neat feature that Southwest offers is its “Southwest Companion Pass,” which allows a qualified traveler to bring along a guest on every flight they take, free of charge. The best way to do this is by taking advantage of the 50k credit card sign-up bonuses. For example, if you apply for both a personal and business version of the Southwest Airlines® Rapid Rewards® Premier Credit Card, you’ll get 104,000 miles if you meet the minimum spending requirements. That’s 50k bonus points per card, plus 2k standard points per card for $2,000 in spending for a grand total of 104,000 points. If you use the Rapid Rewards Shopping portal you can maximize your points with 5X offers. Additionally, you can sign up for Rapid Rewards Dining and get thousands of bonus sign-up points fairly instantly. Once you gather enough points for the Southwest Companion Pass you can use it immediately. And it’s good for the full calendar year in which you earned it, and the following calendar year after. So to maximize the Companion Pass, it’s best to qualify around the beginning of a calendar year (like January) so you squeeze nearly two years out of it. But points must be earned in the same calendar year in which you earn the Companion Pass, so you need to earn those 110,000 points ASAP once the calendar strikes January 1. A good strategy would be to open the two SW Airlines® Rapid Rewards® Premier credit cards in late December, then spend $4k on them in the beginning of January. That, plus the shopping portal and/or dining program could make you eligible by the end of January, if not sooner. *Keep in mind that points transferred from Ultimate Rewards accounts (e.g. Chase Ink or Chase Sapphire) do not count toward the Companion Pass. However, you can transfer them to Hyatt and then on to SW, though you’ll only get about a 2:1 redemption ratio. What Else Does Southwest Offer? With the Southwest Airlines Rapid Rewards Premier Credit Card, there are no change fees, no blackout dates, and points don’t expire. You can also redeem Southwest points for Amazon gift cards at a decent value if you have no plans to travel. Your 1st and 2nd bags also fly free, unlike most other airlines that charge you an arm and a leg for just one bag! That’s a pretty sweet deal, especially if you’re a frequent flyer. And the $99 annual fee is essentially offset by the 6,000 bonus points awarded annually ($100 value), so it’s a pretty solid travel rewards credit card with a relatively minimal fee. It’s also a Visa Signature card, meaning you get access to special discounts, complimentary 24/7 concierge service, no pre-set spending limit, and $0 fraud liability. Keep in mind that this bonus offer is only good for a limited time and will likely expire shortly. After which, a less attractive offer will probably takes its place. For the record, the current offer was only around for a limited time before being slashed in half, so take advantage while it’s here again. This is probably one of the best travel rewards credit cards out there at the moment given its opening bonus, especially for those who travel domestically. Previous Previous post: Are Credit Cards Bad for Your Credit Score?